Well it's official, our "little" Carly is a butterball! At 10 weeks she weighs 13lbs 10 oz and is 23.5 inches long. She's in the 95 and 97th percentiles respectively. But she certainly is so cute and precious to us! 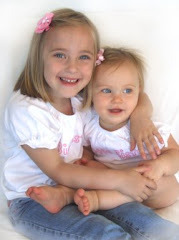 Leah loves her little sis and her favorite thing to tell her is, "I love you for all my life." It's so sweet! I hope it stays that way! Leah is starting to really like her new preschool and is becoming really good at recognizing letters and their sounds. She'll be reading in no time! She also loves to cook and loves making "souffles" which is usually whatever mom will let her mix in a bowl - water, ice, spices, marshmallows, pasta, candy (a good way to use it up without getting eaten! ), etc. She really loves to help out in the kitchen too with real cooking, especically muffins! Carly's biggest things now are smiling, babbling, sleeping through the night and holding her head up. Those are some big accomplishments for the little one!